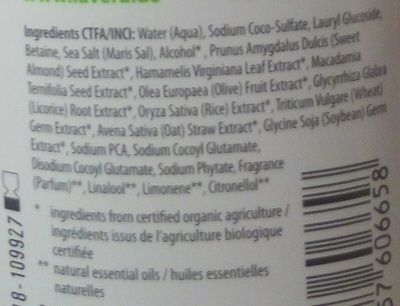 Water (Aqua), Sodium Coco-Sulfate, Lauryl Glucoside, Betaine, Sea Salt (Maris Sal), Alcohol, Prunus Amygdalus Dulcis (Sweet Almond) Seed Extract, Hamamelis Virginiana Leaf Extract, Macadamia Ternifolia Seed Extract, Olea Europaea (Olive) Fruit Extract, Glycyrrhiza Glabra (Licorice) Root Extract, Oryza Sativa (Rice) Extract, Triticum Vulgare (Wheat) Germ Extract, Avena Sativa (Oat) Straw Extract, Glycine Soja (Soybean) Germ Extract, Sodium PCA, Sodium Cocoyl Glutamate, Disodium Cocoyl Glutamate, Sodium Phytate, Fragrance (Parfum), Linalool, Limonene, Citronellol. Product added on March 9, 2016 at 1:10:38 PM CET by sebleouf. Last edit of product page on July 9, 2018 at 10:23:38 AM CEST by tacite.